An important family tradition: every year the week before Christmas, our mom would haul us all downtown on the train and bus to The Loop. Here was a kind of Mecca for all school kids because it is the heart and soul of culture and shopping in Chicago. Year after year we would make multiple class field trips to the Lake Michigan beaches, Grant Park, the Chicago History museum, the Art Institute, the aquarium, planetarium and Navy Pier, the Field Museum of Natural History, The Museum of Science and Industry, the central public library, and every kind of symphony orchestra, lyric opera, theater, and ballet or music concert venue imaginable. This along with more than 100 high-end stores of every variety – all in one six block area bounded by the Chicago River. Field trips were fun and educational, but it was Holiday Fun Time when mom would take us downtown, because we’d get to see Santa at Marshall Field and Company Santa Land. Then we’d buy brand new shoes at the only Buster Brown shoe store in Chicago, on Wabash Street. To get there, we had to walk through the intersection of State and Madison, the most famous corner in Chicago. The garish, blinking colored and strobe lights of the theaters, dance clubs, and cocktail lounges were a great distraction for me and my brothers, Steve and Tom. Mama had to herd us along the way like goats. My baby sisters, Phyllis and Janice, mostly just fussed like always. Thinking back, it seems ludicrous that my mother would shuttle us all downtown for Christmas shoes and smiles, using just public transportation. That’s how dedicated she was to us. She didn’t drive a car, but she was determined to control her world, and ours. She was building traditions; my parents were building a family. Nothing would stand in their way. Chicago’s Loop was a fairytale land for my burgeoning brain. My favorite hobby was people watching. For a kid who loved watching people move about and interact with each other as much as I did, The Loop was like entering Shangri-La. I watched and made mental notes. I specifically remember thinking at the time, “All around me — what a bunch of Chicago CHARACTERS! Some day I’m gonna write about them.” At Christmas in The Loop even the shoppers contribute to the magic of the scene. Every man and woman wears a hat, and a top coat adorned with Christmas goo-gaws, or red poppies to remind us of the war. The packages they carry are wrapped in green, red, silver, and gold paper and ribbons, carried like watering cans one in each gloved hand. Everybody has a scarf around the neck. Every man and most of the boys wear galoshes like mine and my brothers’. They are black rubber and snap with stiff black metal buckles. My brothers are too little to work them. I have buckled more buckles than any other older brother that ever lived. Or it seems to me. It wasn’t always toys that were thrilling at Christmas. We loved our Christmas clothes. Once at a Collector’s Fair, I found an original Rudolph the Red Nose Reindeer wool sweater, the exact sweater I wore every Christmas morning when I was young. It had a particular feel and smell I can remember to this day. Probably because it stayed in my mother’s cedar chest the rest of the year. Wearing something that is stored in a real cedar chest has its own magic. It has what we called in Chicago “Moy.” Something special, something that wasn’t there before, or at least if it was you forgot about it, but now you have it back, welcome home. Welcome home on my chest, old Rudolph ol’ pal. New dress clothes were important presents to receive at Christmas, and greatly appreciated by us kids – albeit, never as much as a bright shiny new toy. But toys stayed at home. When you went out, you wore new clothes and felt important. Almost all aunts and uncles gave you clothes for Christmas, never toys. My most important annual Christmas present was a new pair of shoes, chosen by my mom. I had terribly tender, wide, flat feet, and every pair of shoes I ever owned would hurt me. They were always leather; there was no synthetic material then. They cramped and crushed my feet, almost from the time I took my first steps. When they were wet, they would actually shrink after I’d dry them near the radiator. As I grew older, I discovered tricks to stretch my after-school shoes so I could wear the same Chucks, Keds, or Red Ball Jets that the other kids at school wore. Regardless of their use – school, playground, or church, good-fitting shoes have always been my most prized possessions. In fact, my parents spent much-needed money to preserve the memory of those first precious steps that I took as a toddler, by having my baby shoes dipped in bronze. You could have that done professionally for around $4.00 then. Many parents did it at home for $2.00 with a custom bronze solution. 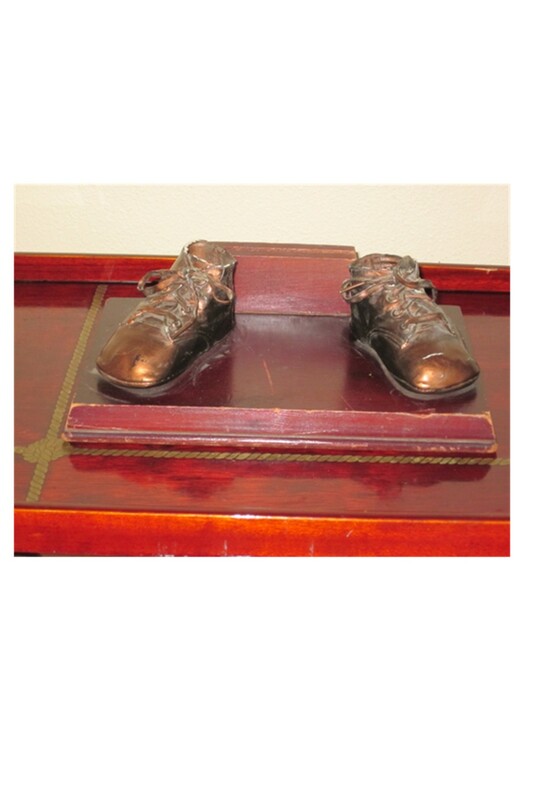 But if you wanted the shoes mounted and preserved as an heirloom, it could cost upwards of $15.00. 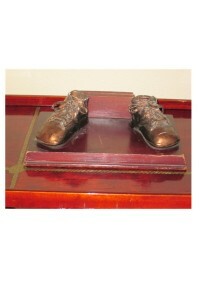 My shoes were mounted on a glossy Mahogany base and embellished with a plaque, now missing from its slotted sanctuary. Gone are the words, what I wouldn’t give to know what it said. Words disappear, but the sentiment remains – my parents wanted me to know how joyful they felt when I took my first steps in those shoes. So old now that I can see the white fabric and stitching under the bronze on the inside of the shoes. By golly, to think that fabric is as old as I am! How’d we get to be preserved these past 60-plus years?! Oh Lucky Man that I am, I’d be willing to bet I’m the only one in the family who still has his or her bronzed baby shoes. Considering my long-standing history of foot and shoe problems it’s no surprise that my most treasured Christmas tradition was when my mom would take us downtown to Chicago’s Loop Shopping District for new shoes. If a kid has problem feet, you take him to Buster Brown. That’s just what you do. 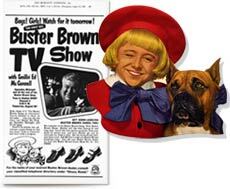 I didn’t argue – the first comic book I ever bought with my own allowance was about Buster Brown and his pals. He was a city boy, with rich parents, and a frisky who got away with pranks and never repented, even, and especially, after receiving a whipping over his mama’s knee. My kind of hero. Buster Brown’s was a futuristic way (as in 50’s futuristic whoo-whoo) to fit your shoes, especially if you were plagued with tender feet. I’d stand in the “modern” X-ray shoe-fitting machine and wiggle my toes, watching my toe bones moving around inside my shoes. The x-rays penetrated the shoes and feet, and then struck a fluorescent light that glowed constantly, like an alien space ship. That especially appealed to me. This resulted in an image of my skeletal feet within the shoes. The fluorescent image was reflected to three viewing ports at the top of the cabinet, where the customer, the salesperson, and my mother could view the image at the same time. When no one was looking, I’d slip my hand in the machine and make skeleton signs. “Look, Steve, I’m like Dracula!” I’d wiggle my feet and giggle like a madman! I left the store wearing new leather BB shoes, feeling like a king. What I learned, when he has new custom-fit leather shoes, every man is a king. 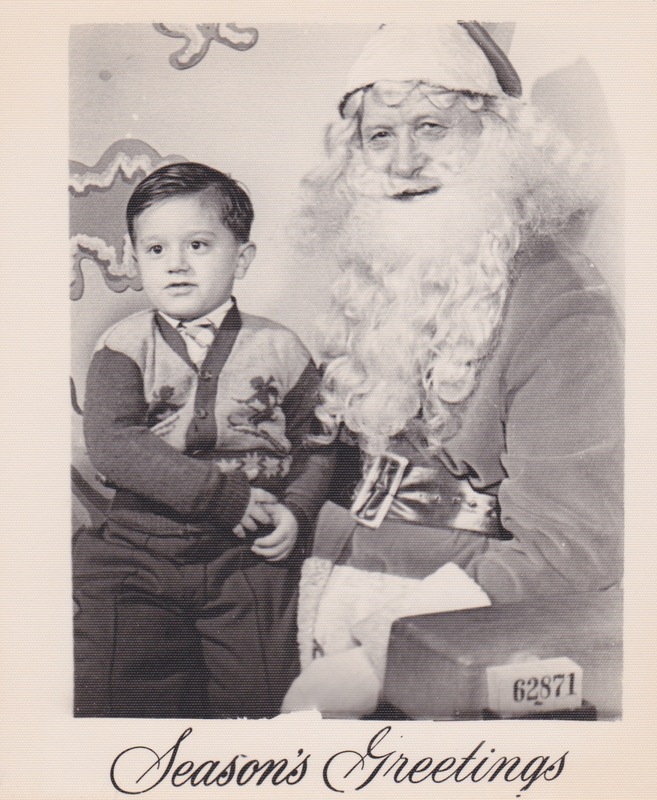 My first Christmas of any importance was 1951. Just a toddler, I can’t remember much about what happened. But I do remember, it was historical. As seen in the photo, my father and mother are sitting with me under our Christmas tree. Alone. The three of us. This would soon mark the end of my chance to be an only child. Soon, more children, more presents. More staying up until midnight on Christmas Eve, helping my dad put more toys together, for more brothers and sisters – until there were eight, altogether. My mother asked my grandfather before the birth of Lori Beth, my littlest sister and last child, “What should we call this one, Dad?” Like he’d been waiting his whole life to drop the bomb, Grandpa said without a hitch, “Why don’tcha call it QUITS? 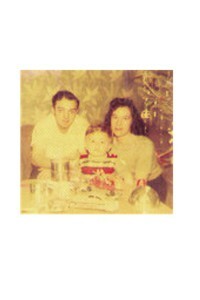 !” But for the Christmas of ‘51 I was alone with my parents, and was a spoiled, only child at that. Every present I received was brand new. No hand me downs or toys with worn out gears, like my sibs would get from me, like I always got from my older cousins. Naw, at Christmas everything is new, metal and shiny – no plastic during those days. I see some of our old toys now and again at Collector and Antique shows, and it dazzles me to see the toys we treasured those years. Someone loved my toys as much as I did, and took the time to preserve them in their original condition and box. Would that somebody in my family had the presence of mind to save all those metal toys from the 50’s. I’d be appearing on OPB’s “Antiques Road Show” with a big old smile on my face. Dad, I just happened to come across an old photo of you today while I was packing boxes! You are probably about 2-3 years old, sitting on Santa’s lap. 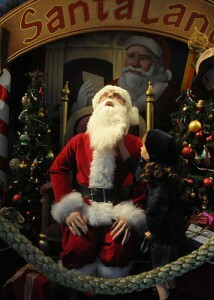 And Santa looks OLD, let me tell you! It says “Season’s Greetings” on the bottom, and I think you’re wearing that Rudolph sweater you were talking about in this blog!! 8 years ago by Amy G.
I grew up in the south side of Chicago and I, too, remember making a trip with my mom & brother and sister every summer before the start of school to the Buster Browns!! And I also remember there was a red indian standing on top of a tobacco store somewhere near there, too. I also loved being downtown during Christmas and all the storefronts – it was a magical childhood. Thanks for the memories!